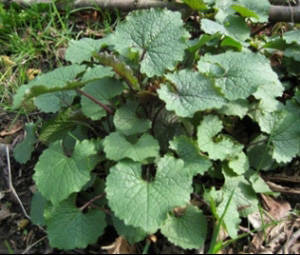 In their first year, garlic mustard plants grow as rosettes of kidney-shaped leaves that lie close to the ground. The leaves can stay green all winter. Have you noticed that the earliest plants to show green and leaf out are usually invasives? They range from non-native honeysuckle shrubs in the woods, to Norway maples in our yards, to multiflora rose along edges of fields and trails, to purple loosestrife in our wetlands, and more. Like the other invasives, the relatively new invader garlic mustard (Alliaria petiolata) is getting an early start in Westborough. Now is a good time to pull it up, before it blooms and bears seeds. Even if you haven’t seen it yet, you may have heard about garlic mustard. It smells and tastes like garlic but belongs to the mustard family. Garlic mustard is a biennial, so the plants actually live for two years. 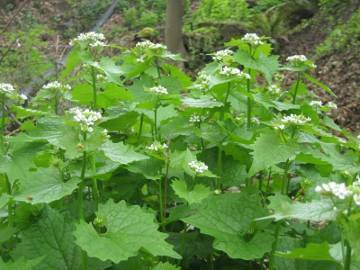 April, May, and June are the months during which garlic mustard is easy to spot. Garlic mustard plants in bloom, topped with clusters of small, white, four-petaled flowers. Because their leaves can stay green throughout the winter – sometimes even under the snow – you can often spot first-year plants in April and early May. Look for green plants growing as rosettes, which are circular clusters of leaves lying close to the ground. If you find clusters of low-growing kidney-shaped leaves, pick a leaf and tear it for a sniff test: if it smells faintly of garlic, you’ve found garlic mustard. The rosette is a good stage for pulling up the plants. In May and June, the year-old plants develop stems that rapidly grow 1-1/2 to 3 feet tall. They quickly bloom with clusters of small four-petaled white flowers, go to seed, and die by the end of June. They usually have kidney-shaped leaves near the base of the plant and triangular leaves up on the stem. The plants are easy to spot at this weedy stage, too. Remember the sniff test. It’s important to pull up the plants before they go to seed. Once the plants start producing long, straight seedpods, it’s best to bag them in dark plastic bags, tie the bags closed, and throw them out (in the bag) at the dump. Otherwise, you might spread the seeds. In June of their second year, garlic mustard plants bear many long, straight seedpods (seen here near the top) and then die. 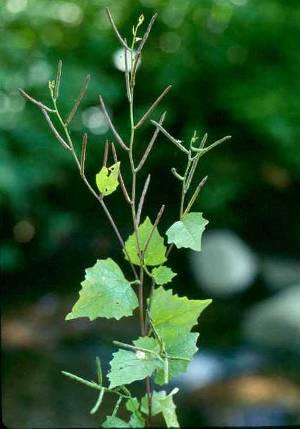 What makes garlic mustard so invasive? One reason is that garlic mustard produces large numbers of long-lasting seeds. It can self-pollinate, so a lone plant can produce seeds whether others are nearby or not. And when a single plant goes to seed, it produces thousands of seeds – up to 8,000. These seeds can survive 10-12 years in the soil. For more than a decade after the original plant is gone, new invaders can spring up from the "seed bank" left in the soil. There’s another reason why garlic mustard grows profusely and spreads rapidly in North America, but not in Europe and Asia where it came from. Here garlic mustard is free from the competing plants and natural enemies that keep it in check in its own native environment. In Europe, for example, it grows in patches but doesn't take over an area. There, at least 30 different insects attack the plant. Not so here. Even our hungry white-tailed deer won't eat it. They don't like the garlicky taste. The best way to stop an invasion is to nip it in the bud, so to speak, by removing the plants when the first small numbers of them begin to arrive. To protect your own property and neighborhood, as well as Westborough’s open spaces, learn to recognize and remove this relatively new invasive plant. One way to do so is to attend the Westborough Community Land Trust’s garlic mustard pull on Sunday afternoon, April 28, 1:30-3 p.m., at the Bowman Conservation Area parking lot on Bowman Street. Bring gardening gloves and wear long pants, long sleeves, and sturdy shoes.